This house is not a prop. It's an actual fraternity house near downtown Flint. It's been there since the early nineties. It has parties with more than 300 people. But during a stroll down Garland Street one day I happened upon an actual fraternity house. 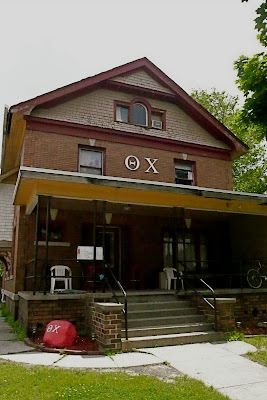 Theta Chi. I was stunned. 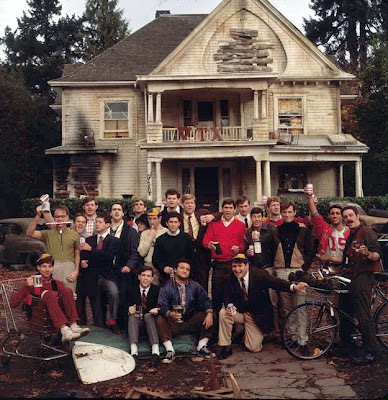 I know, I know...GMI/Kettering has had frats forever, but this was right near downtown and it looked a little like Animal House, not like those low-slung ranch-style numbers near Ballenger Park and Mott Golf Course. My favorite part of the tour was the half-eaten birthday cake that looked like it had been there for a few weeks. There was some exposed piping in the ceiling leaking into a bucket near the table. It all seemed very collegiate to me. And the knowledge that there's a group of smart, funny guys — with reasonable standards of cleanliness — living near downtown was really encouraging. When I took a tour of the UM-Flint campus with Flint Expat Randy Gearhart a few days later, we both remarked how, well, collegiate the campus looks, especially the expansive lawns near the dorm on Kearsley Street. When I was living in Flint, I was never exactly sure where UM-Flint started and ended. Now, there's no doubt when you're on campus. I'm still not convinced that Flint can become a college town like Ann Arbor or Columbia, Missouri, but parts of it are definitely shaping up as a place where youngsters can hang out and pay lots of money for a degree. That's a good thing. Now if we can just get some of the Communication majors to help the city and county produce less embarrassing promotional videos. Do you want people like this in downtown Flint? I would say, yes, you do. David Bainbridge (left) and Cade Surface (Right) and a fish (Above) they caught with their bare hands in the Flint River. 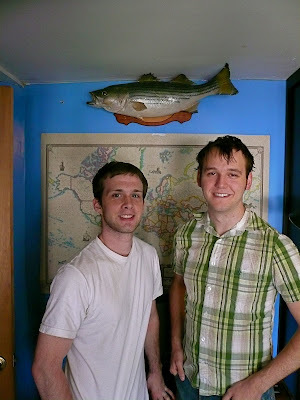 Cade did not coordinate his shirt with the fish for the photo; it was just a happy coincidence. 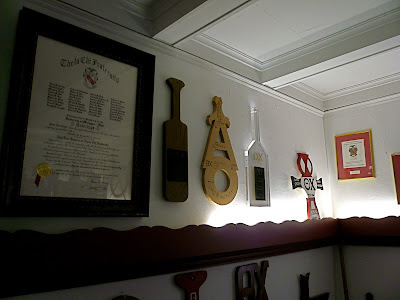 The infamous Paddle Room, er, Chapter Room. No idea why fraternities are so into this stuff. 1. What does Genesee County need most? 2. Name a part of Genesee County that begins with "D", where a sane manufacturer would be *least* likely to put a new factory? That would be, ummm, Downtown Flint. 3. How many times did the professionals who made the aforementioned old-school promo video mention "Downtown"? Somewhere upwards of a zillion. I didn't get an exact count because watching was too distressing. I did expect them to break into choruses of an old Petula Clark song, though. 4. Why would the GRCC be promoting Downtown Flint? What percentage of Genesee County residents, or business owners, consider Downtown Flint to be the County's top economic development priority? I don't know the answer to that one...nor do I know who around here is in charge of "agenda coordination". My guess on the latter is no one, since it's clear it's not the GRCC. By the way, was that bass a *real* bass, or a *billy* bass? Regarding the Flint Marketing video... I seriously couldn't watch it. As soon as the woman's voice and techno 80's music came on, my mind was sent back to high school civics class... glazed over by crappy graphics and voice overs... wishing I could pass a note to someone. I remember when you came by for this tour, I was only a year into this Fraternity. Now I am a senior getting ready to graduate. I wish you could see the house now, at that point it was a wreck compared to now. We raised thousands of dollars of our own money and put months of work into completely renovating our living room, 3rd floor to bring it up to fire and safety codes, basement, and this summer we will be painting the outside. Thank you again for the kind words and come back any time to see how far we've come. We are very passionate about helping UM Flint and Flint as a whole become the city it deserves to be, and we will continue to do so for years to come. Jordan, I'll have to come by again and check the place out. And congratulations on making it to senior year. You're almost done!